It was a fortuitous twist of fate when in the 1990s Ben Olewine, IV signed up for a multi-day field trip on forest management and the effects on birds and their habitats. The excursion connected Ben with then- chairman Cliff Jones, who ultimately persuaded him to consider service at the Sanctuary. Soon after, Ben joined Cliff on the board of directors, served on the science and education committees, and quickly developed a strong belief in the power of Hawk Mountain and its international Conservation Science Training Program. Ben believed in the vision and reach of this critically-needed training, as well as the need to support trainees after they leave Hawk Mountain. “Young people come to the Sanctuary, are trained, and go home, but often they need seed money to start their own conservation projects and careers. Hawk Mountain needed to help get them started,” he explains. With his family, Ben did just that. With his father, the Harrisburg-based wholesale food giant and beloved civic leader and philanthropist, Ben Olewine III, Ben and his family established the Benjamin Olewine IV Project Soar Awards using funds annually from the Olewine Family Trust. Since 2003, Ben and his family have faithfully provided support for seed grants, and Hawk Mountain each year uses the funds to jumpstart careers in conservation for the best and brightest graduates. 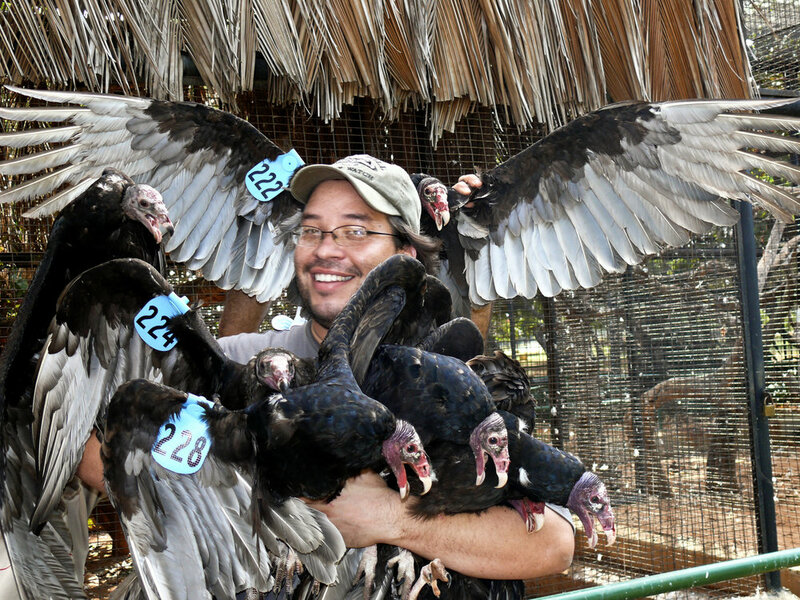 Adrian Naveda, for instance, immediately returned to Venezuela to launch a turkey vulture monitoring program (pictured), while Karen Aghababian and Vasil Ananian studied Levant sparrowhawks in Armenia. Matias Juhant studied molt and migration behavior in South American raptors, while Corinne Kendall of the United States monitored the movements of East African vultures in the Great Rift Valley of the Maasai Mara National Reserve. A businessman by nature, Ben enjoyed an illustrious consulting career in business development and marketing for some of the world’s most iconic brands, but his heart has long since been held by conservation and, in particular, bird conservation. In fact, following his “retirement” from his business career, Ben spent nearly ten years on the board and as treasurer of BirdLife International, where he focused on conservation philanthropy and spent several months abroad each year as part of his “volunteer” work. Hawk Mountain is proud that Ben considers the Sanctuary and Project Soar a priority, so much so, that he made plans to ensure the funds continue in perpetuity. Recently, Ben shared his intent to name Hawk Mountain the benefactor of an IRA that will provide Benjamin Olewine IV Project Soar Grants for generations to come. Ben Olewine with Hawk Mountain President Sean Grace stand outside the Acopian Center for Conservation Learning.